A scene from Savannah, Georgia at the Hermitage. The caption tells us more: "Cabins where slaves were raised for market - The famous Hermitage, Savannah, Georgia. Image online, courtesy Library of Congress. When they arrived on southern plantations, slaves did not share the comforts of their owners, and their homes did not remotely resemble their masters’ homes. Slaves gather by rank at the front and rear of the Stirrup Branch Plantation in Bishopville, South Carolina. Some slave owners expressed patronizing concerns about their human "possessions." Plantation view at Port Royal Island, South Carolina. 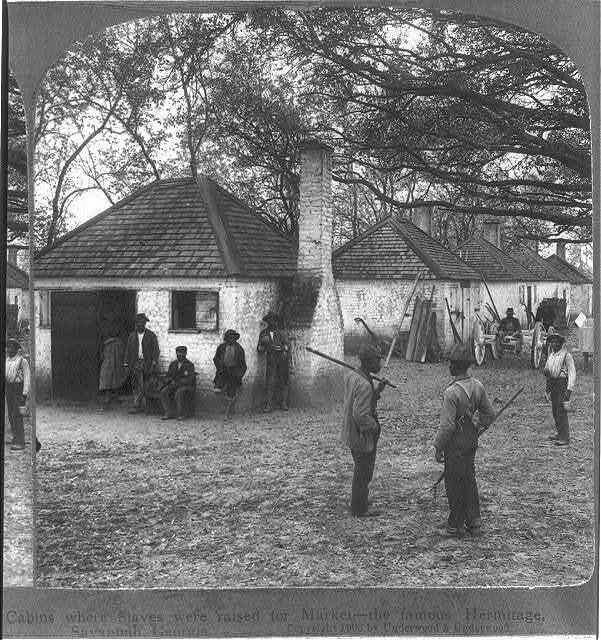 Slaves, at home in Spotsylvania, Virginia. Enslaved African-Americans on Smith’s Plantation, Port Royal Island, South Carolina. African-American church at Smith’s Plantation. A slave cabin near the Long Bridge at Chicahominy River, Virginia. Jonathan Eastman Johnson painted an idealistic scene of black slaves interacting with white owners in "My Old Kentucky Home." In real life, few slaves lived so well. Slaves were brought to America to work the southern plantations. Let’s briefly look at that aspect of their lives. Bos, Carole "SLAVE HOMES" AwesomeStories.com. Jul 01, 2003. Apr 20, 2019.